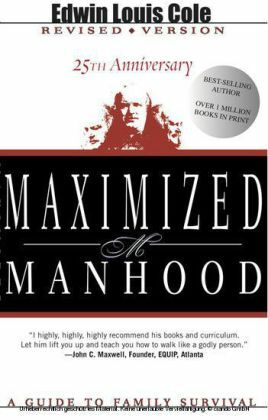 Maximize your life, as millions of men have worldwide, by studying the Christian classic, Maximized Manhood! Edwin Louis Cole, the 'father of the Christian men's movement,' spoke with a prophetic voice to men. Just months before leaving earth for Heaven, he revised his signature work, adding five crucial chapters he believed would strengthen Maximized Manhood for the next generation. Almost two million copies of Maximized Manhood and its curriculum are in circulation today in more than forty languages. Dr. Cole and his wife Nancy served the Lord in ministry for more than fifty years. The ministry they co-founded with their son Paul, Christian Men's Network, still strengthens men worldwide with the reality that 'manhood and Christlikeness are synonymous.' The best-selling book for men in the world...just got better!